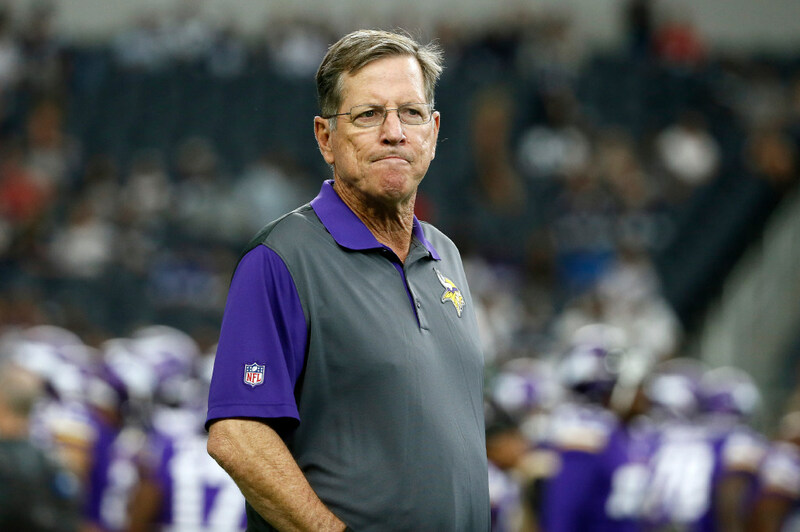 Norv Turner and the Vikings: what went wrong and who is to blame? The Vikings have been a below-average offense since Turner arrived in 2014, and he is one of the main common denominators in those struggles. Norv Turner is out as Vikings offensive coordinator after 2 1/2 years on the job. Vikings head coach Mike Zimmer described it Wednesday as a true resignation and a surprising one at that. But even if we take Zimmer at his word, regardless of how you frame the semantics of Turner’s departure, a successful offensive coordinator does not typically leave a 5-2 team in the middle of a season. So what went wrong here, and who is to blame? It’s a complicated question, of course, filled with a lot of chicken-or-egg scenarios. Let’s dive right in as we attempt to gain some clarity. *Personnel-wise, Turner didn’t always have a ton with which to work. In 2014, he was breaking in a rookie quarterback (Teddy Bridgewater) while dealing with the on-field consequences of Adrian Peterson missing all but one game with his legal problems. In all, Peterson (including playoffs) wound up playing in exactly half – 20 out of 40 — games in which Turner was offensive coordinator. Having arguably your most valuable offensive player available for just 50 percent of the games is hard. Turner also had to deal with the transition on the fly from Bridgewater to Sam Bradford this year. And in all three of his years here, the Vikings’ wide receiver group has been average (at best). That said, the job of an offensive coordinator is to maximize the skills of the players he has. Turner seemed inflexible at times, relying on a passing attack that requires a good offensive line to thrive (more on that in a minute). The Vikings have been a below-average offense since Turner arrived in 2014, and he is one of the main common denominators in their struggles. *That leads to a discussion of the offensive line. Again, this has been a below-average unit. And again, Turner wasn’t gifted with great personnel. The Vikings’ unwillingness to use high draft picks in an attempt to solidify their line is having a direct impact on their 2016 season. The Vikings fired offensive line coach Jeff Davidson shortly after last season and brought in Tony Sparano. Injuries have played a major role in the line’s shortcomings this season, but it’s also fair to question just how good the line would be if everyone was healthy. It’s also fair to question Turner’s culpability in the subpar line play. For starters, a downfield passing attack asks a lot of pass blockers. Even if the offense seemed a little more diverse at times this year, a scheme is a scheme — and Turner’s might not be the best to minimize the struggles of the line. Also, he’s in charge of the offense. Zimmer said Wednesday he gave Turner virtually full autonomy to run that side of the ball. When defensive backs fail, it’s not the position coach who takes most of the heat — it’s Zimmer, the defensive mastermind. When the offensive line fails — as it has in both pass-blocking and run-blocking this year — the offensive coordinator is on the hook. *Bridgewater’s injury and the trade for Sam Bradford might have signaled the beginning of the end. Zimmer praised Turner for being a great coach and teacher, and by all accounts he had a strong rapport with Bridgewater since both arrived with the Vikings at the same time. Not only did Bradford’s lack of mobility expose the woes of the offensive line, but also Bradford has great familiarity with Pat Shurmur, the coach replacing Turner as coordinator. Shurmur was Bradford’s OC in St. Louis in 2010 and Philadelphia in 2015. He’s arguably in a better position to get more from Bradford than Turner could based on familiarity and scheme. In a quarterback league, that means a lot. Zimmer said Turner told him upon his resignation that this was the best thing for him and for the team. *Zimmer also said the Vikings offense under Turner was about more than numbers. That’s true, to an extent. Last year, for instance, the Vikings seemed to play complementary football – a ground-based offense that didn’t dazzle but minimized mistakes helped a stout defense win games. But the numbers still do tell a story. The Vikings rank No. 31 in yards per game this season (293.3) after ranking 29th last season and 27th in 2014. If scoring is more your thing, Minnesota is 31st in estimated offensive points per game this season at 15.7. Last year they were 21st. Two years ago they were 26th. Those numbers will never tell the full nuanced story of why the offense struggled, but they do paint a pretty clear picture of underperformance during the entirety of Turner’s tenure. The Vikings can be a playoff team with a mediocre (at best) offense. They showed that last year. But if the Vikings are true Super Bowl contenders, they can’t afford to underperform on one side of the ball.